I can personally vouch for the all round brilliance of the Fletcher 19. I used to have one, and I loved it. They are such a good all-rounder. Small enough to launch, retrieve, handle, clean, berth and store yet big enough to take a family out for the day (and over-night if one has had a couple of beers). With a little sink, cooker, cockpit table, loo, full camper cover and a decent size bed, she is a truly versatile boat. All that said, her stand out feature has to be the sea-keeping and handling. Such a brave and tough boat when the sea chops up. I used to leave other much bigger boats in my wake when the sea picked up. Massively in this ones favour is the engine, the 4.3V6 is the ideal engine in this model. Being slightly heavier than the 3.0L, gives a better trim angle, together with more power she is a well balanced and quick boat. The owner of this one has gone to no small effort and expense to have a freshwater cooling system added. This was done by his very capable brother who is a fine marine engineer. Apart from one or two minor berthing marks, she is in lovely condition. She comes with a new camper cover and the braked twin axle trailer as seen in the pictures. 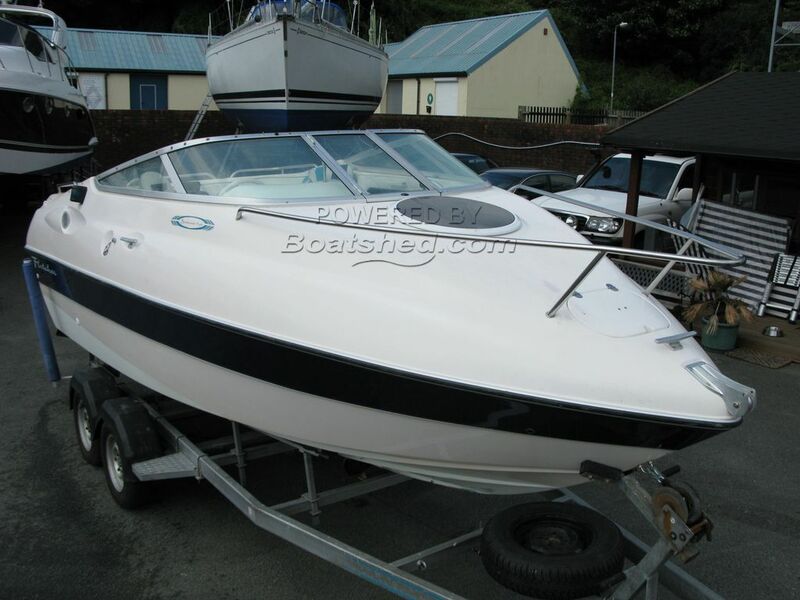 This Fletcher 19GTS has been personally photographed and viewed by Mike of Boatshed Wales. Click here for contact details.